English sentences are among the easiest ways to form. The following article will briefly summarize English sentence formation for you. But first, you need to understand the basic and general information about English sentences. A sentence is a group of words that starts with a capital letter and ends with a period (. ), question mark (?) or exclamation mark (!). It has two parts: the subject and predicate. The subject is the main topic of the sentence while the predicate tells something about the subject. When it comes to structure, an English sentence can be simple, compound, complex, or compound-complex. Simple sentence contains one independent clause. Example: I like dogs. Compound sentences have two independent clauses joined by a conjunction. Example: I like dogs but my sister hates them. Complex sentences have one independent clause and or more dependent clauses. Example: I like dogs that chase Frisbee when throw it at them. Compound-complex sentences have at least two independent and one dependent clause. Example: I like dogs but my sister hates them because they chase her every time she gets home. Advanced terms. There are other advanced terminologies used in sentences. These include the object, transitive/intransitive verbs, adverbials, and the complement. The object is the person or thing being affected by the verb in the sentence. However, when a verb does not have an object, it is called intransitive. Adverbials are words or expressions that have the same functions as an adverb. Lastly, complements are additional words like ‘looks’, ‘seems’, ‘like’ that give more description about the object or subject. 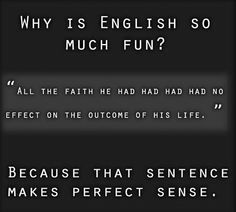 Know the basics of English grammar. The basic grammar will help you a lot in forming your sentences. If you are well versed in grammar, you will be able to grasp the right words to include in your sentence and what goes where. Use sentence formation online. There are online sentence formation services that you can use to help you form effective sentences. These online sentence formation are widely available and now being used by students and professionals alike. Using punctuation correction tools is also a big plus. Rewrite and revise. You may not get everything perfectly on the first draft but you can always rewrite your sentences to make them better. In rewriting, do not forget to consult a grammar reference for better results. Be clear. Start by stating a clear subject and then write things around it that can describe it – this is your predicate. Write simple sentences at first and then gradually step up for compound ones, then complex and finally, if you are more confident enough, write in compound-complex. Organize your thoughts. Put the most important things first and avoid unnecessary and vague words such as ‘really’, ‘totally’, ‘very’, etc. to avoid confusion. This useful tool is a program-based tool that allows users like you to put on their sentences and get corrected automatically. This tool is widely used today and one of the helpful instruments to deliver correct english sentence structure. Here, you can just copy and paste your text and the program will edit it for you. A new and edited correct articles will be provided and you can easily paste it to your document. Use this guide to learn more about English sentence formation today!